With the holistic approach Ayurveda is so well known for, it is no surprise that this traditional science provides numerous remedies for obtaining a clear and healthy complexion. According to Ayurveda, the health of your skin is far from superficial, rather it is a clear picture of your internal health. Therefore, if you are experiencing any skin issues such as acne, redness, dryness, rashes, eczema or blotchiness; then to really get results one must provide treatment from the inside and out. Ayurveda states that the skin directly relates to the liver, the blood, the gut (including digestion) and to Pitta dosha. If there is imbalance, toxins or irritation in any of these areas it is likely to show up on the skin, especially with chronic issues. People are often under the misconception that the skin is only an external issue, such as too much dirt or oil on the face. They then spend a lot of money on skin care products and see little results. Another misconception is that oil is bad for the skin, and instead the use of alcohol based products (typically with perfumes and other chemicals), is therefore good. However, the use of heathy oils such as coconut, sesame, sunflower and almond oil is a much better option for all skin types than to use these irritating, drying products. Ayurveda strongly believes that what you apply to the skin should be as natural as anything you would put in your mouth, as the skin absorbs things into the bloodstream just the same. Ayurveda also states that the skin is the gateway to the nervous system, and therefore applying healthy oils with herbal-infusions is an incredible way to not only treat skin disorders, but also any disorder of the nervous system. This includes anxiety, fear, restless mind, restless sleep, insomnia, oversensitivity, irritation, MS, neuralgia and neuritis. Click here to read more about the Ayurvedic Self Oil Massage. Purchase our Medicated Skin Oils here. So if you are dealing with acne, eczema or any other skin issue the first step is to discover the root cause(s), so they can be remedied at a deeper level. While you are working on removing the cause, you can simultaneously use simple Ayurvedic skincare remedies to help alleviate the symptoms. This may include detoxifying the system, pacifying the Pitta (or heat) in the body, reducing the stress levels, taking appropriate herbs and applying Ayurvedic treatments to the skin directly. Tikta Ghrita, also know as Bitter Ghee is a powerful tonic for the liver, blood and skin. Directions: Take 1/2 tsp of Tikta Ghrita each morning on an empty stomach for any skin issue such as acne, eczema, psoriasis, rash, redness and general irritation. For severe skin issues increase the dosage to 1/2 tsp, twice daily before breakfast and dinner. Tikta Ghrita can simultaneously be applied directly to the effected skin area each night before bed. Read more on “The Health Benefits and Uses of Tikta Ghrita” here. Purchase our handcrafted Tikta Ghrita here. Aloe is incredibly soothing to both Pitta and the skin. It also acts directly on the liver and cools any excessive heat in the body, making this tonic perfect for blemishes and other skin disorders. Directions: Mix 1/4 tsp of turmeric, a pinch of neem and 2 Tbsp of aloe in 1/2 cup of warm water. Steep for 5 minutes, stir and drink. Follow with warm water. Take this 3 times a day, before meals for at least 30 days. Cilantro is one of the top herbs for Pitta disorders, liver issues and any rash or irritation on the skin. It is also a powerful detoxifying agent for heavy metals and other general toxins. Directions: Take 1 bunch of cilantro; wash thoroughly and chop. Add this along with 2 cups of water to a blender, and blend on high for 1-2 minutes. Once you are left with a pasty pulp, strain out the liquid using a cheese cloth or thin dish towel. Strain all of the liquid into an airtight glass jar to keep fresh. Take 2-3 Tbsp (depending on the severity of the rash or irritation), three times daily. For mild skin issues, take 1 Tbsp, twice daily. Store the remainder in the refrigerator. ***The pulp can be applied to the area of rash or irritation after the straining process is complete. Click here for our full article on the health benefits and uses of Cilantro Juice! 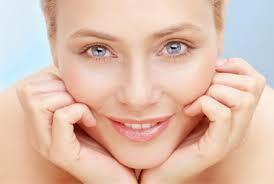 As mentioned above, acne and other skin issues typically involves an imbalance in the liver. Therefore utilizing Ayurvedic herbs that target the liver will be a great compliment to any skincare regimen. Some of the top liver supporting Ayurvedic herbs include Kutki, Neem, Turmeric, Daruharidra, Guduchi, Kalmegha, Bhringaraj, Manjistha and Anatamul. Try our all new Love your Liver Tincture! Since Pitta is generally involved in most skin issues, then taking Pitta-reducing herbs will also be of much benefit (generally speaking). Some of the best Ayurvedic herbs for this include Shatavari, Licorice, Vidari, Guduchi, Kutki, Nettles, Anantamul and Neem. Notice that many herbs that act on Pitta also act on the liver! 6. Drink 12-16 ounces of warm lemon water each morning. The most simple remedy you can do to begin your path to clear, healthy skin is to drink 1-2 cups of warm lemon water, first thing each (and every) morning. This will not only help to rehydrate the system, but will also help to flush out toxins from the body and promote healthy elimination. Plus the lemon acts to heal the liver directly. Click here for our full article on the health benefits of warm lemon water in the morning! 7. 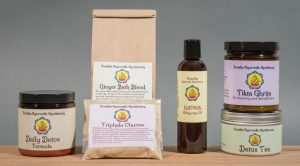 Perform a Kitchari Cleanse or Ayurvedic Detox. Performing an annual or bi-annual cleanse each year is a great way to reset the system, flush out unwanted toxins and increase the digestion. This in turn will have a very direct effect on clearing the complexion. Whether you do the basic Kitchari Cleanse or a more intense detox using Ayurvedic herbal treatments, these are both very effective ways to start your path to clear skin with a bang! 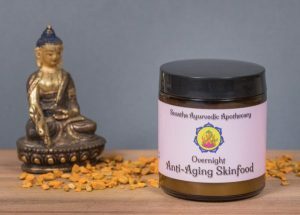 Try our Overnight Anti-Aging Skinfood!